With the following chart from Goldman's Robert Boroujerdi, we can finally close the book on whether US corporate leverage is at all time highs. It is... and it's even higher on a "normalized" basis. As the Goldman strategist writes, even as corporate defaults remain near historically low levels, froth (there's that word again) "has been building in the form of corporate leverage. While this may not present a near-term risk, the widespread increase in debt resulting in stretched leverage metrics bears watching, in our opinion." 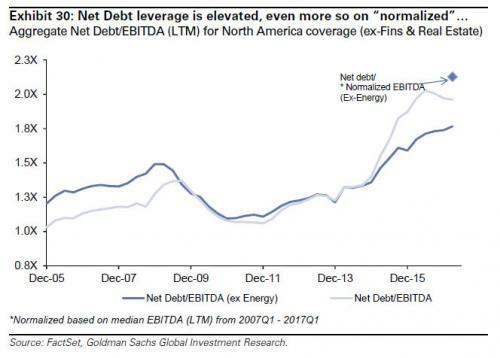 Goldman adds that while the pullback in Energy earnings in recent years has stressed aggregated Net Debt/EBITDA, even excluding that sector, the ratio is at the highest point since the financial crisis. Finally, Boroujerdi makes an interesting caveat: "Given we are 8+ years into an economic expansion, we believe it’s prudent to also view this via a “normalized EBITDA” lens (i.e., median NTM 2007Q1-2017Q1). On this basis, aggregate leverage (ex- Energy) would move up to 2.1x, roughly 20% higher than current levels and 18% above the prior cycle peak." While much is rightfully made of the leadership of Tech, the promise of Financials and the conundrum of Low Vol, an area to which we believe investors should pay closer attention is the High Yield (HY) space. A combination of the search for yield, lack of supply and a benign default environment has driven HY spreads to near their tights. Meanwhile, much like the VIX, these spreads are diverging versus increased Policy Uncertainty – a historically strong relationship. Further, many equity market factors are increasingly correlated with HY spreads while the options market suggests concern on the come (e.g., elevated skew versus other fixed income markets). It is against this backdrop that we showcase the extremes forming and the historical “playbook” in terms of factor performance if spreads do widen. Hint: You sell growth. TINA, at least when it comes to yield: US HY spreads have tightened 60bp in 2017 and are near the lowest level since the Great Recession. In yield terms, this equates to a yield-to-worst (YTW) of 5.5%, which is near multi-decade lows. Fundamentals: Leverage stretched, defaults benign: Low rates have incentivized companies to raise debt and leverage is elevated. That said, defaults have been benign at about 2% over the last year (ex Energy, Metals & Mining), which is significantly below the 30-year average of 4.7% on the back of sustained, if uninspiring economic growth. A word on technicals: The search for yield along with the recent lack of supply is also likely playing a role. Almost 1/3 of the YTD tightening occurred in July alone as primary market issuance was basically nonexistent ($9 bn, the 2nd slowest July since 2010). Equity investors are paying attention: While low yields/tight spreads indicate that credit investors do not see much risk in their market, the strong performance of our Balance Sheet factor (Low Net Debt/EBITDA vs. High) this year suggests equity investors are increasingly nervous. Notably, this has been driven by both legs of the trade working – in plain English, this mean that names with low leverage have outperformed the average stock while those with weak balance sheets have underperformed. And if anyone is still wondering whom to thank for this market distortion, read this.